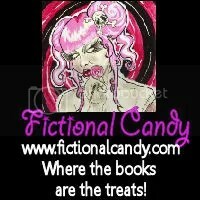 This is an essay I wrote for the blog Fictional Candy to coincide with a book giveaway. Indie writers have a bad rap. There’s a stigma that these authors couldn’t cut it in the real world of publishing, and therefore used the resources of the internet to bypass the gatekeepers of talent. Some writers, admittedly, deserve this stereotype. For your first story, you probably shouldn’t publish it. You should email it to friends and family for their enjoyment, ask for feedback from strangers online, and grow before you try to stake a professional claim. But what about projects rejected for reasons other than talent? Those rejected because they are considered “not marketable”? Marketability is actually more important than talent to the business side of publishing. Don’t believe me? How else can you explain this? Sure, at some point, talent is marketability, but not always. You could’ve penned the best vampire novel ever written, but the odds of getting accepted by a publishing house are extremely low—the market is flooded with vampires and therefore it might be rejected based on marketability. You could try writing a Twilight prequel! Or not. So they will kill your work before it’s even born, and it’s up to you to resurrect it. You have the power. It’s no longer “Can I?” but “Should I?” Short stories are a perfect example. You can’t market a single short story as a publishing house, but you sure as hell can self-publish it online as an indie author. And if it’s good enough, you should. Which brings me to INFECTED and “Click Your Poison” books. No, it wasn’t rejected by a publishing house—it wasn’t even submitted to a publishing house—it was rejected by Hollywood. Back in 2008, INFECTED was a screenplay. It made some ripples in the pond, did well in contests, and even won me a little money. What it didn’t do was attract studio attention. Why not? It was good, I was told, but it needed to either be based on existing intellectual property or be a zombie musical rom-com. Read: Marketability. Not wanting to compromise my story, I shelved the project. Cut to four years later and an idea to make a “Choose Your Own Adventure” series for grown-ups. * I knew right away that INFECTED needed to rise from the dead. A book where the reader can finally find out for themselves if they would survive the zombie apocalypse? Marketable! I believed this so much so, in fact, I decided not to even attempt the traditional publishing route. It’s the new Wild West in publishing, and that makes indie authors the new outlaws. But soon, very soon, “self-published” will no longer be a dirty word. *Choose Your Own Adventure® is now a registered trademark of Chooseco, LLC, and is not associated in any way with Click Your Poison™ books. 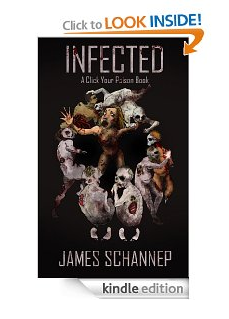 Head on over to Fictional Candy to enter the giveaway for a free copy of INFECTED! ← Zombies & Spirits Unite!